Jamil Jan Kochai's 99 Nights in Logar is a fine novel about an Afghan-American boy returning to Afghanistan that reminds us where the publishing industry puts it money. This is not a review of an Afghan-American writer's first novel. To call this a review of Jamil Jan Kochai's 99 Nights in Logar would be unfair, because the novel is fine. This is an essay about some of the disturbing trends in the publishing industry that Kochai's novel makes rather clear. You see, contemporary literary fiction deploys a trend that used to be common in science fiction publishing: the fix-up. What this used to mean is that science fiction writers would pen a story (or stories) featuring the same character/s in a shared world, sell those stories to the magazines, and then expand or inter-link the stories more explicitly and sell the resulting novel to a publisher. What was initially a way for popular fiction writers to make more money off of roughly the same content—while getting the opportunity to revise, expand, and hone content (if we're being generous)—has become a mode of discovery for contemporary fiction writers, and a way for agents and publishers to try their hands at finding a new big name in up-market lit fic. Pakistan-born Afghan-American Jamil Jan Kochai won the 2018 O. Henry Prize for outstanding short story published in a literary magazine for "Nights in Logar", which appeared in the slick magazine, A Public Space. The story was a semi-autobiographical look at the experience of an Afghan-American boy returning to Afghanistan after several years, in the midst of American invasion/occupation. It was a touching, powerful story, the sort that gets snapped up by literary fiction magazines both on account of its author's obvious facility with language, and because it tells about a diverse experience of the world without being too critical of the inequalities that mark such diversity as "progress" within an historically white (male, heterosexual, etc.) literary marketplace. This is not a criticism of Kochai or his story, but a comment on the state of the literary fiction market and the way it rewards craft but does so selectively to encourage a progressive—read: never-ever radical—vision of how the publishing landscape might change. Kochai won the O. Henry in his first year of the Iowa Writers Workshop MFA program, arguably the most prestigious MFA in Creative Writing, and a year later he has a book out from one of the Big Five that expands his prize-winning story into a modestly sized, beautifully designed, heavily promoted novel with blurbs, reviews, and best-of listings everywhere that matters. 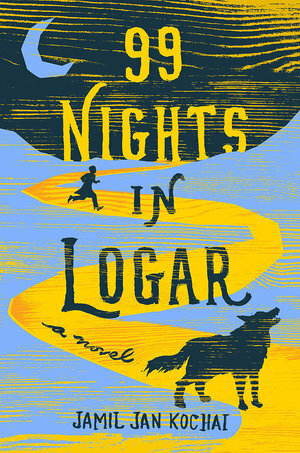 Unsurprisingly, 99 Nights in Logar takes a story of an immigrant's return to his country of emigration, and the emotional (and sometimes physical) pains that crop up, and expands it into a much more fantastical set of tales that have something of a throughline, as they are all the first-person experiences of Marwand during his trip "home"(?) to Logar. By no fault of Kochai's, its title, story, and pitch as a "universal" story about our "human" capacity to tell stories seems to conflate Afghans, Arabs, and Muslims into a larger identity of "Middle Easterners affected by American wars", and in doing so the novel (again, as product of the publishing industry) wants to make non-Middle Easterners feel like we are Marwand, that his experience is just like that of the boys in David Mickey Evans 1993 film, The Sandlot (a movie we are presumably supposed to have liked? )—only browner, if you will, with bombs exploding in the mountains at night, and American soldiers threatening the children as they adventure. While the novel is held together by narrative perspective and by the search for a beloved family dog named Budabash (a search interrupted by a hundred pages or so of intervening "nights" in Logar), the novel as a product of the publishing industry seems to exist more as a reference to A Thousand and One Nights and a larger sense of an exotic Afghanistan. The New York Times Book Review, quoted in promotional material, even uses the words "Old World Afghan storytellers" to sell 99 Nights in Logar's narrative and cultural authenticity to readers. ("Two Young Men Come of Age Amid Violence and Pathos Overseas", 21 Feb 2019.) What the promotional material obscures is that the review was by Dina Nayeri, an Iranian-American novelist; so while the reviewer might be able to speak from a place of familiarity with the sort of experiences related by Kochai's novel, Viking (owned by Penguin Random House) chose to obscure such connections and in doing so produced an even more universal interpretation: one of the world's premiere cultural arbiters (rather than an individual Iranian-American novelist) is calling it a product of "Old World Afghan" storytelling traditions. Buy it and experience Afghanistan, already! 99 Nights in Logar is a fine novel. It doesn't always flow smoothly, but Kochai (and his editors) have clearly put a lot of work into both the sentence-level craft and the larger structure of chapters and sections. The novel features numerous shorter stories that are related by Marwand's relatives (those "Old World Afghan storytellers") that create unique breaks in Marwand's narration, flesh out familial, territorial, and ethnic histories of various family members, associates, and public figures, and that often tie back in to later plot points. These are excellent moments when Kochai shines as a storyteller, but he also excels at voicing the Americanisms of an Afghan-American 12-year-old and how these come into conflict with his Afghan family who have stayed in Afghanistan. 99 Nights in Logar is, in a few words, finely crafted but not perfect; and this is a good thing (see my Nov 2018 article on Alyson Hagy's Scribe: perfectly crafted, absolutely hollow). Kochai's first novel is a good book, but it's not incredible; it's memorable, and represents a unique and important entry in the increasing literature of the Middle Eastern diaspora in the US, documenting how American-backed wars and conflict have spread into the days and nights of children the world over. It's also memorable that Kochai was able to include an entire chapter (several pages) in Pakhto (or perhaps Farsi, though the former seems more likely since Marwand does not speak Farsi); this is a rare occasion for an Anglophone novel, and has the dual effect of both lending cultural-linguistic authenticity and distancing non-Pakhtophone readers (a balance that I'm sure the editors at Viking weighed very carefully at an internal meeting or two). At the same time that Kochai's novel qua novel offers something important to the contemporary fiction landscape, the publishing situation of 99 Nights in Logar reminds us yet again how the Big Five are far more interested in producing and selling cultures, how they do it in the service of a supposedly progressive vision of changing the Whiteness in publishing, and how a fine book gets the apparatus of a bestseller behind it.